This course will provide an overview of Hispano-Indo history and clarify the various ethnic labels. Mayan/Aztec and Arabic/Spanish contributions to the Americas will be reviewed. 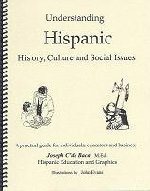 The Origins of Hispanic stereotypes and diversity are examined. Hispanic religious, cultural traits and acculturation levels will be presented. Current social, political, and educational issues that affect Hispanos will be discussed. This course will help educators improve their knowledge and understanding of Hispanic history, culture, and address schooling and student academic achievement issues. Educators will analyze statistical, educational, and social demographics that are related to Hispanic students and schooling trends in the United States. Participants will clarify the origins of Hispanic ethnic labels and accurate use of them as well as the cultural contributions of the Maya, Aztecs, and Islamic Spain. Educators will examine the origins of Hispanic stereotypes and myths regarding Spanish history or culture and explore them from a Spanish perspective. Participants will learn about and contrast various Hispanic cultural views, behaviors, and traits to distinguish them from U.S. culture and/or normal adolescent behavior. Educators will understand Hispanic religious beliefs and practices as well as the current immigrant assimilation and acculturation process. Educators will review learning theory and methodology for improving their instructional effectiveness regarding teaching Hispanic student's basic skills and core knowledge. Educators will synthesize the course content, power point shows and DVD's to develop a comprehensive approach to effective teaching and improving student achievement.